What is more important to you...a unique experience at a Victorian era mansion, a welcoming host who will help you locate activities of interest to you and your family, clean and economical accomodations or an easy setup for your RV at a peaceful, rural campground? No worries...Wayne County offers all these options! 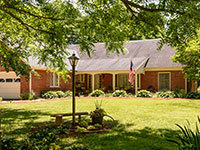 The friendly staff at the Old National Road Welcome Center is happy to assist you with your lodging reservations. Just call 800.828.8414. 14 Room Italiante-style home, each room has indivdual heat & air conditioning controls. If you know of a business that was inadvertently left off this list, please notify info@waynet.org. Weeb Eubank, famous NFL coach who directed the Baltimore Colts to a NFL championship in 1959 and guided the upstart New York Jets and quarterback Joe Namath of the old AFL to the world title in 1969 was a Richmond, Indiana native.